IMPORTANT NOTE: Read the description for instructions before installing. Warning: This patch is for 2004 Edition game owners only, BFG Edition and Steam version owners do not install this patch. [26/06/2016] Made an easy-to-extract SFX Archive to help solving most problems that happen while extracting. [02/09/2015] Updated to work with Resurrection of Evil expansion aswell. Fixes "couldn't load default.cfg" error. Fixes "different DLL API version" error. Updates the game's Protocol to the latest version. Works for Resurrection of Evil Expansion too (The game might appear under the mods section after installing the patch but won't boot properly unless you had it already installed before). Contains files of every official patch released for the game prior to v1.3.1 Patch. This patch has been only tested with CD-Retail 2004 version of the game, so it will not work with BFG Edition, it should also work for every version of the game. NOTE: do not install this on the Steam version, that version should be already updated to the latest version so you don't need to install this on it. Download and install this patch. Download and install the official v1.3.1 Patch, to register CD-Key information from it and avoid Blue errolog window. How to find out whether the patch worked or not: Start up the game and open the Console, It should tell you what game version are you running on bottom left of console. This patch was the fix I needed to make Doom 3 work with Win7 64bt. It works great for me. Thank you! Now for a side note for those having resolution problems getting Doom 3 to run at 1920 X 1080 etc.. you have to edit the Autoexec.cfg file in the Doom3\Base folder. This is the way mine is set up at the moment... You can alter the multiSamples (AA), and you can alter the anisotropy (AF), if you choose to. The AA right now is set to 8X with these settings, but you can use 0,2,4,8,16? Same goes for AF with the 0,2,4,8,16 I think? I just have it set to 0 for now, but by all means try out 16 if you like. I think it looks pretty good like this anyhow. Once you've finished tweaking the Autoexec.cfg file, click save of course, and launch Doom3 to check it out. Hopefully everything is working as it should except in my case it still lists the resolution as the lowest possible setting in the game, but I think it's just because there is no preset for 1920 X 1080 listed in the game menu. So don't be alarmed to see that. Just load up the game and it'll be looking good. I hope this helps all of those who had the same problems I did. It works for me. Give it a try and good luck. Sorry I was wrong about the AF settings. 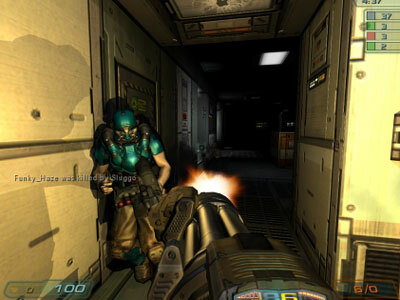 image_anisotropy [1,2,4,8] - This setting determines the level of Anisotropic Filtering used in Doom 3. Valid values are 1, 2, 4, and 8. The higher the value, the lower your performance, but the crisper textures will appear in the distance. Note that 1 is the lowest you can set for Anisotropic - 0 will simply default back to 1. Also note that if you have forced Anisotropic Filtering in your graphics card's control panel, it will override this setting, so for optimal performance set the Anisotropic Filtering level in your control panel to 'Application Preference', and adjust the level here. .... So yeah, sorry about that. Set AF to 8 instead of the 16 I stated in my previous post. Okay ... just so you know, the autoexec.cfg you've created is in most cases not going to be executed automatically, so if it wasn't executed try opening console and type "exec autoexec.cfg"
Have you tried reinstalling the game ?, that command prompt Window isn't supposed to show up . Adding this patch results in the game asking for the Doom 3 CD-Key and it will not accept the key that was entered when it was originally installed from CD. Starting the game with the internet disconnected makes no difference. Un-patched game runs without a problem. I'm not sure, Because basically this patch is just every previous game patch combined into one easy to extract patch, I Have changed absolutely nothing, Ask Bethesda or redeem your CD-Key on steam . Thanks for your reply. As its the original CD version, I've had no dealings with Bethesda or Steam. I've also noticed since my post that my original CD-Key is one that is available on the web - so that may be the reason that it won't work with the patched version. I guess I'll have to stick with the original un-patched version which works O.K. Ok, just so you know the unpatched version is "Outdated" and won't support most recent mods and won't allow you to join Multiplayer servers . Did you ever find a fix? I have the same problem. It might be because of Steam version, Steam version is by default Updated to 1.3.1 so i think the patch is causing a CD Key conflict, maybe you should avoid using it for Steam . The patch is required if you want to join Multiplayer games though, And if you want to run v1.3.1 Mods . Changes are not noticeable before or after installing the patch, But it is required if you want to join Multiplayer games or run mods that are compatible only with this game version patch (1.3.1) . If you're having an issue, Describe it here . You shouldn't install it if you're using Steam version, it's already patched to v1.3.1. I just downloaded the patch, but I don't know how to use it,....can anyone please advise? Locate your Doom 3 folder by clicking the button "Browse" then select it, then Click "Extract", If it asks to overwrite files click "Yes to all" . I downloaded and extracted everything to it's proper position but when I start the game it gets to the intro screen then shuts down and gives me a message saying that I have the wrong version of the DLL game API. do you know what's wrong? the un-patched version of the game works just fine. Which game edition are you installing this patch on ? Steam or CD-Retail ? BFG or 2004 Edition ? . Which version are you installing this on, CD-Retail or Steam ? BFG or Non BFG ? * If It's CD-Retail it should work fine, If it's Steam or BFG Edition you shouldn't install it. I have the retail Version of Doom 3 after the patch, they ask for my CD-Key at the main menu of the game. However, the game rejects my CD-Key stating that it is invalid. I'm not sure, The Patch isn't fully mine, it's just a combination of every patch released before v1.3.1, to make it easier to update CD-Retail version to that version, to install the official patch you have to install every patch before it, but with this patch you don't have to. So if you get any CD key related issues, you better try redeem the game on steam with that CD-key if you haven't given it to anyone else already, I wouldn't recommend using CD-Retail version anyways. Will this patch make it so it will work on Windows 10? I have installed the original retail disc version (from 2004), but when I try to start it up, it says to "login with administrative privileges and try again." But, I am logged in as an admin. Right click the game exe and click "open as administrator" if this is still happening. Can some tell me how to install this patch to my game? I have the retail version. ASAP if possible. All you have to do is extract it to the main Doom 3 folder (eg : C:/Program Files/Id Software/Doom 3/) and overwrite files when it asks you. is it working in Windows 7 32bit? I have BFG version how do i make multiplayer work? Invite your friends to your lobby. Nope, this isn't a translation patch. Word of advice to anybody downloading this patch. If you are planning to use Doom 3 AND Resurrection of Evil, make sure you install BOTH of these before adding the patch. Plus, refer to the top comment on this post about the autoconfig.cfg edit or the game might not cover the entire screen despite it being set to fullscreen. Well it isn't required to have ROE though. when(with winrar) i extract the patch in the main doom 3 folder ("C:\Program Files (x86)\Doom 3\") the system asks me if i want to overwrite the files.I press overwrite for all the files but in the log of winrar is written "impossible to create the file",access denied (it says it for every files or folder),then i'm unable to install this patch. Open the patch as admin maybe? (Right Click and press execute as administrator) to give the file the permission to overwrite, make sure you close Doom 3 or anything related to it first (Restart if closing the game doesn't do anything). It's the steam version .exe, originally this patch was intended to work with Steam version too because Dedicated server tool wasn't included with it for whatever reason but it caused some other errors so It's not recommended to install it on Steam version of the game, only CD-Retail version is supported.